It’s no secret that we all love buttons. Button crafts and art ideas are so attractive that they are simply hard to resist. Here are some 50+ button art and craft ideas that you can try. 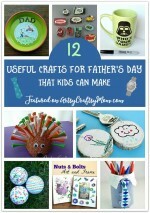 Some are so simple and fun that you can craft together with your kids. Take a look at these 50+ button crafts and start having fun with your loved ones. Make these gorgeous flowers using buttons and wire. Idea via craftandcreativity.com. These stamped flower craft is super easy and super fun to make! Idea via happyhooligans.ca. Sherri shares this wonderful craft of button shamrock in her blog. All you need is clothespin, buttons and glue. I loved this button topiary craft. Hop on to buttonsgaloreandmore and find more about making it. Whip up this cool flower bouquet with craft supplies you probably have at hand. Buttons, some felt flowers, skewer sticks, ribbons and thread. Here is another button bouquet tutorial by Bellezza. She also offers a PDF version of her tutorial in case if you want to download and save for future. Check out this attractive button art of tree branch made out of twig, buttons, canvas and glue. It sure is amazing! Idea via meetthedubiens.com. This one is a simple and cute button flower craft that can also be used as a brooch. It’s perfect for kids. Here is a button flower bouquet which is not hard to make and it’s cheap too. Susan shares this elegant white bouquet craft using florist stem wire, floral green tape, wire cutters and of course buttons! Find the ideas of making animal shapes out of old animal pictures, buttons and glue. Idea via squamishbaby.com. Easy button owl craft for kids to make with lots of buttons, canvas and glue. How about making a button elephant wall hanging for your little one’s room? Found on bustedbutton.com. Here is another kid’s room decor craft – Button Fish! All you need is colorful buttons, felt sheets or kitchen towels and glue. Grab the idea of button spider craft. Found on blogspot.com. This one is a fascinating peacock button craft on canvas. It’s going to be a bit time-consuming, but you will be happy with the result. Check out this clothespin-button-ant craft. It’s perfect solution for a funny summer craft for kids. Kids will love this adorable button caterpillar. Even then small kids can do this easy craft with minimal help from adults. Here is a fun project for parents and little ones to do together. Draw a butterfly shape and spice it up with watercolors, buttons and beads. I loved the idea of making animal faces and shapes with nothing other than buttons and glue. Open in Google Chrome, right-click on the page and select ‘Translate to English’. Make this wonderful moon collage with different buttons. Idea via adventure-in-a-box.com. Here is a sweet button cupcake art. This is a perfect choice for a gift or a room decor project. Check out this super easy idea of putting up a vibrant button tree on a canvas. Found on craftsbyamanda.com. How about making a button mermaid art? Young children might find it a bit tricky, but older kids especially mermaid fans are going to love this. Make this easy button monogram craft using fabric, buttons, needle and thread. This is a button snowflake craft using craft sticks, buttons and glue. You can either hang it up or can simply prop up your shelf or table space. 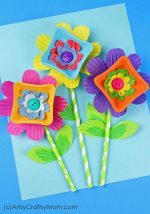 Check out this spring button craft for kids. Found on littlefamilyfun.com. Let your child paint a rainbow on a piece of paper. Stick colorful buttons and complete the vibrant rainbow art. Make this simple yet charming button art with wooden letters and buttons. A little bit of creativity can go a long way. How about a shamrock art with rainbow chevron background? Debbie shares the template too in her blog so that you can download it easily. Make this beautiful button bib necklace and earrings. Michele shares the complete tutorial in her blog. Try these cute little bracelets with colorful buttons and thread. You can try different color combinations and sizes of your choice. Grab the idea of making a button Christmas tree earrings. A great idea for a DIY Christmas tree ornament too. Use beautiful and attractive buttons to make cute little rings for your little one. How about making your own sets of matching fabric earrings for all your favorite outfits? Hop over to brit.co and see for yourself. Make this cute looking button headband for your little one. It’s a great idea for a party favor or a party craft. Here is a different button bracelet made out in a unique pattern. This photo tutorial will show you how. Check out this retro button necklace tutorial from Yellow Blackbird! You have already seen button bracelets, rings, earrings and necklaces. How about making a fancy button belt? Here is a super fun craft for kids – Animal face button necklace! These cute button rings are simply hard to resist. Found on yellowgiraffe.in. This is a super easy button craft for small kids out of hair clips, buttons and glue. They can make matching pairs for each dress too. These button Christmas trees are so cute. You can whip up one using wooden thread spools, glue and buttons of various colors and sizes. How about this amazing and unique idea of making a button bowl all by yourself? Kristen shares this superb idea in her blog. Go figure! Here is yet another out-of-the-box idea of making a little bitty button book! You can download the templates with pictures and pages in PDF format for this craft. Rachel shares this cool idea of making a paint stick button flag. Idea via iheartcraftythings.com. Make these beautiful button acorns out of Styrofoam ball, buttons, fabric and glue. Grab the idea of making a stunning resin paperweight using buttons. Pouring resin could be a little tricky. Make sure you don’t leave any bubbles unattended. I loved those button magnets. Found on yellowgiraffe.in. Try out this easy craft of button carrots in 15 minutes! Idea via thecountrychiccottage.net. Make these exciting racing cars out of buttons and clothes peg. Kids would need a lot of help with this project. But it sure looks exciting. Here is a simple button wreath tutorial for everyone. Make these easy button ornaments for any season. So simple and so adorable. Make these easy button bookmarks for kids using paper clips, fancy buttons and glue. The steps are so simple that you just have to assist with gluing part. So many fun ideas!! I love button crafts. Thanks for sharing! 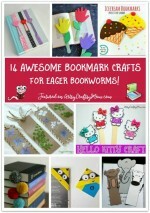 I inspired by your Crafts especially Bookmark crafts and Button Crafts. Thanks for giving me so many ideas to make kids are going to be busy with these Ideas in this Summer.